"Buy-In at the Top Leads to Districtwide Greening"
A school sustainability program requires both district-level support and grassroots enthusiasm to be successful. Nik Kaestner has been Director of Sustainability for the San Francisco Unified School District since September 2008. He has established greening programs for the Palo Alto Unified School District, and for Stanford University. The School District pays the utility bills for each school, so staff and students have had little incentive to conserve water and energy resources. It was also frustrating that greening projects that did exist were taking place in piecemeal fashion, instead of being informed by a district-wide vision. With support from San Francisco's Department of the Environment, the school district established a Director of Sustainability position to pull together and support all the exciting work that was going on throughout the District, and to launch additional initiatives. As a foundation, we established pilot Green Teams in 7 district schools. Each team receives a binder with resources from all over. We also provide a $500 stipend to the teacher liaison and $500 in start-up costs to each team. We also now have a website and monthly newsletter to keep district changemakers informed about our successes. We've established partnerships with multiple non-profit and city agencies to enhance and strengthen our efforts. Local agencies provide water, waste, and energy audits for each school. 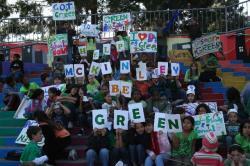 We're working on a draft District-wide Green Schools Policy. We currently have policies on waste diversion, CHPS, healthy commutes, Earth Hour, Bike to School Day, nutrition, and Tools for Schools. Green cleaning -- to be implemented in 43 schools by the end of 2009. There are garden programs at 85 schools. We've implemented a tree planting campaign in collaboration with Friends of the Urban Forest (FUF), SF Green Schoolyard Alliance, and the Mayor's Office of Greening. We aim to plant 2012 new trees in and around SF schools by 2012. We also launched the first annual San Francisco Bike to School Day, and district schools participated in the Earth Hour Challenge. There are 70 schools currently composting food waste, a 40% increase from 2005. All these efforts to reduce the carbon footprint of the District benefit not only the children and adults engaged, but also the community and planet beyond. Green Teams consist of school staff, parents, and students, supported by the District Sustainability Director. The Green Team at Rosa Parks School is now busy planning the projects that will green their school, including the installation of solar panels, a green roof, and new recycling bins. The Willie Brown Jr. Academy threw a garden party to honor community supporters on June 1st. The school garden was bursting with ripe tomatoes, cucumbers, peas, flowers, plums, apples, and succulents. The garden is a thriving example of similar programs at numerous SF public schools that incorporate the students' regular curriculum by teaching them about biology, geology, ecology, and agriculture, using gardens as a backdrop. Commission in conjunction with Rebuilding Together to install a cistern in order to water the native plant garden with catchment water. The gardening committee is also planning classroom vegetable gardens. In addition, Mission High School students held their first-ever Green Prom, with prom-goers generating power for the speakers, recycled materials used for decorations, and party waste largely diverted from the landfill at the zero-waste Golden Gate Club. Our Green Team efforts began in March, 2009, and we've already seen a lot of exciting progress. Recycling, pilot green cleaning projects, and Tools for Schools efforts to improve indoor air quality have been underway for several years. The SFUSD has a great website, launched on Earth Day: www.greenthenextgen.com"
As a teacher, I incorporated environmental concerns into my curriculum. When I became Activities Director, I wove green issues into events; created an environmental representative position on student government; fostered alternative transportation programs; and got Gunn High School (Palo Alto) green business certified. After a brief consulting stint for the Palo Alto Unified School District, I worked for Stanford University, and now SFUSD, helping institutions to go green. I am hooked! Reducing and ultimately eliminating the costly and wasteful purchase and use of plastic water bottles by the District. SFUSD recently negotiated an amazing price of only $5.10 for a BPA-free, stainless steel, reusable water bottle from Cynergreen; the price includes a two-color school logo as well as shipping. The SFUSD Green Teams are primarily focused on utility usage and expenses, but waste reduction, improved indoor air quality, and composting are just a few of our other ongoing priorities. Establishing Green Teams is an essential foundation for all the project work to come. Keep in touch with your community to keep the momentum going. Our website, www.greenthenextgen.com, provides success stories, information about available grants and funding, and training and resources.